Anyways, since I found them, I started to use them again. 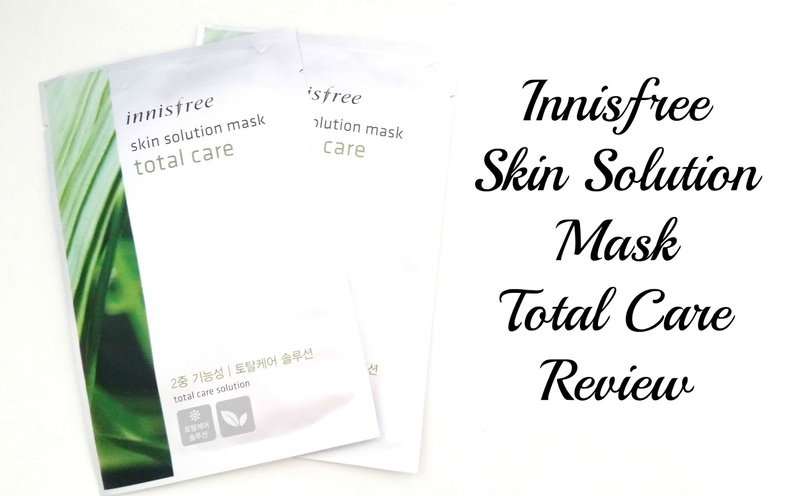 The Innisfree Skin Solution Mask line is one of my favorites from Innisfree. I like most of the masks from this line. It does awesome, super, wonderfulness to my skin and makes my skin happy every time I use one. This one here is the Total Care mask in the line, the mask line also includes Hydrating, Pore, Moisturizing, Whitening, Trouble Care, Wrinkle Care, and Lifting masks. 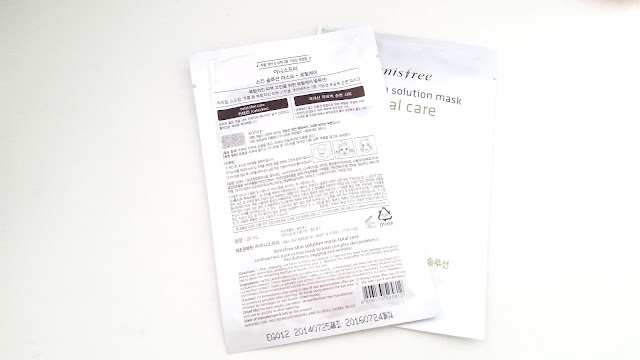 Product Description: Unique sheet masks that use unbleached pure cotton sheets. The Total Care mask works to brighten the skin and reduce wrinkles. 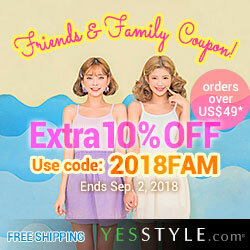 It's formulated with catechin, which helps to enhance skin complexion. 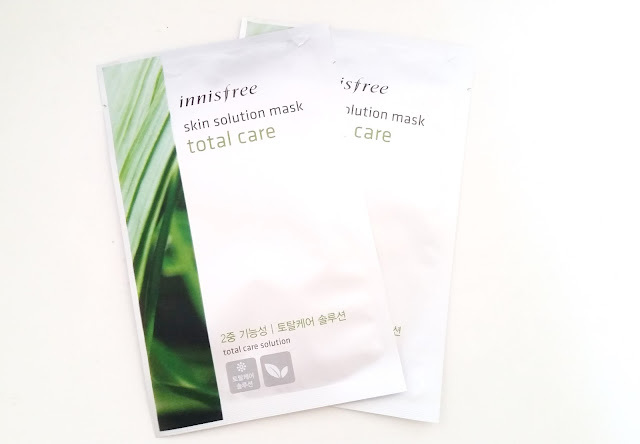 Like many Innisfree masks, it also has the Jeju Green complex which includes ingredients like green tea, tangerine, cactus, camellia leaves, and orchid to keep the skin healthy. To Use: Cleanse and tone the face first. 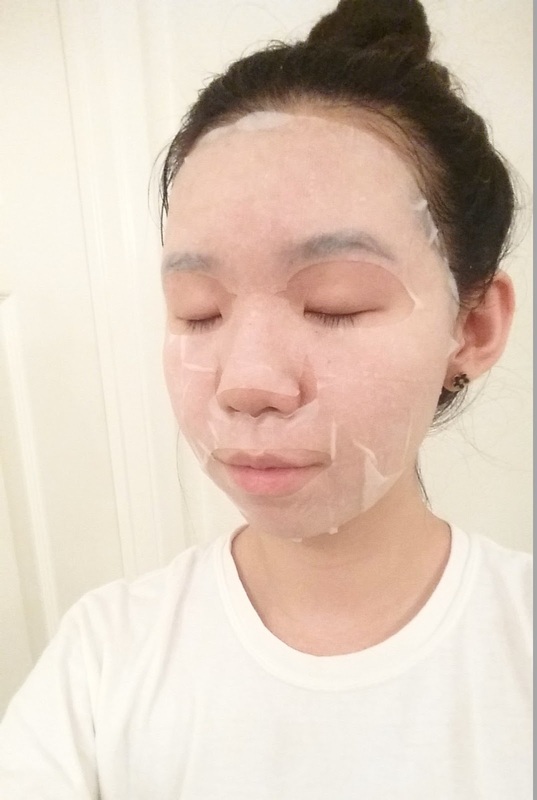 Take the sheet mask out from its packaging and spread it evenly on the face. Make sure the eyes and mouth matches the holes created for those areas. Remove the sheet mask after 10 to 20 minutes. Gently pat in the remaining essence. Packaging: Like all Innisfree masks, the packaging is clean and simple. The front of the mask shows the product's name and its functions. 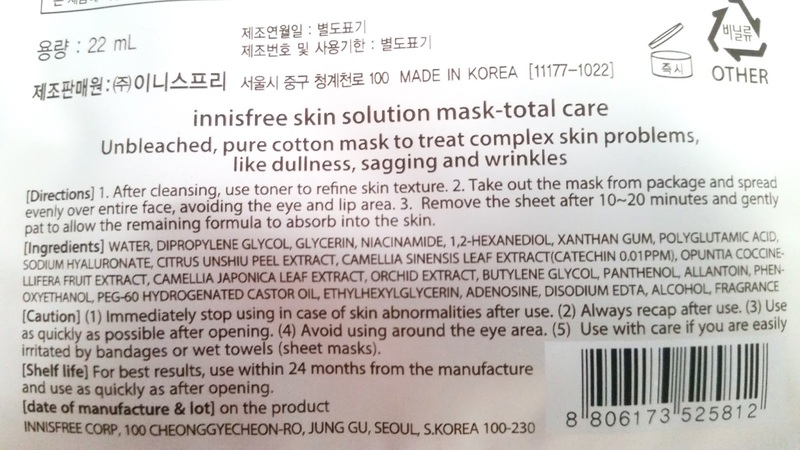 On the back of the mask it includes full description, information, directions, and others in both English and Korean. The back of the sheet mask also includes a manufacturing date and an expiration date. Scent: The Total Care mask smells fresh. It's most notable scents are that of green tea and tea tree, followed by hints of floral and a light hint of citrus. Color: The mask sheet is white-creme ish in color. It's not completely white, it's the color of a unbleached cotton sheet. It can have little specs sometimes which is actually the cotton seed. The essence of the mask is clear. 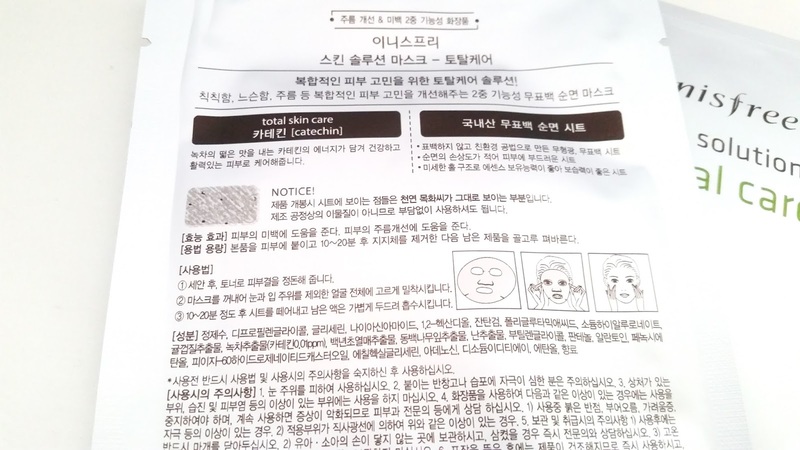 Texture: The essence of the mask is very liquidy and the sheet mask feels a bit thick. The mask sheet is thicker than the masks from Innisfree's It's Real Squeeze line. The mask sheet cannot be teared apart with hands, so scissors will be needed if one wants to cut the mask for a better fit. Ingredients: Water, Dipropylene Glycol, Glycerin, Niacinamide, 1,2-Hexanediol, Xanthan Gum, Polyglutamic Acid, Sodium Hyaluronate, Tangerine Peel Extract, The green Tea Extract(Catechin 0.01ppm), Prickly Pear Extract, Camellia Leaf Extract, Orchid Extract, Butylene Glycol, Panthenol, Allantoin, Phenoxyethanol, PEG-60 Hydrogenated Castor Oil, Ethylhexylglycerin, Adenosine, Disodium EDTA, Alcohol, Fragrance. My Thoughts: I remember the first time I tried this mask after I patch tested and thought it was very moisturizing and soothing. It felt really refreshing and I actually fell asleep wearing it. Bad, I know. I woke up a couple of hours later with sheet mask marks on my face. Oops. First impressions of a mask is always important. If it did wonders the first time, chances are I will want to keep using it. If it does horrible the first time, chances are that mask will be the last I want to use for an evening. I find that the Innisfree Skin Solution Mask in Total Care falls into the category of masks that I love. It's got a long list of beneficial properties and always does wonders to my skin. I can always count on the Total Care masks to make me feel super relaxed when I am using it. I mean, I did fell asleep while wearing one. That's probably as relaxing as it gets. It works wonders at reducing redness on my face and brightening the skin. It's one of my go-tos for nights when I want an extra pick-me-up. It's a very soothing mask and calms my skin after a long day. It can even calm my active acne, which is just wonderful. The moisturizing power is on point. It always leaves my skin feeling supple and moisturized. The mask also have a bit of wrinkle care properties. I don't really have wrinkles, but I do have some fine lines. I noticed that the mask was really able to help reduce the appearance of the fine lines and make the skin feel plump. This mask comes with a lot of essence. I mean a boatload of it. 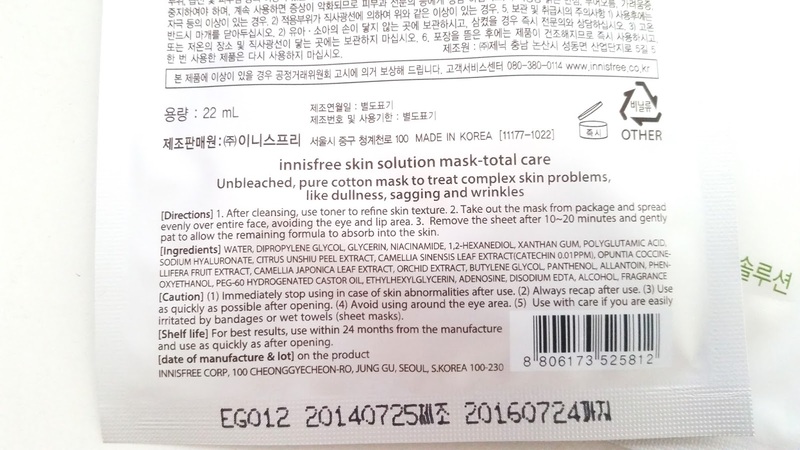 Actually, come to think of it, just about all of Innisfree's masks comes with a lot of essence. So, you can used the extra essence on your body, or apply it on the face, etc. I like to pour out the essence and apply it to my face while the sheet mask is still on. This way, it re-moistens the mask and I can wear it for another 10 to 15 minutes. Final Thoughts: I love, love, Love this mask! The amazing properties that comes with this mask is wonderful and my skin loves it lots. It totally fits its name of Total Care because it really does have all around care. I have sensitive skin and I always worry that masks will irritate it. However, this mask did not irritate my sensitive skin, instead it soothed and calmed my skin. Would I repurchase this mask in the future? Yes! x 100! I really, really like this mask and if I ever run out my current stash I will reorder it. Do I think this mask is worth a try? Yup! I think if you are looking for a mask with as good of a list of properties as this one, then this mask is definitely worth a try. Plus it's super inexpensive as well! Have you tried these Innisfree Skin Solution Mask in Total Care? What are your thoughts on them?